Download Google Areo App: The Google has launched a utility app named Areo on the PlayStore and is presently available only in India, particularly Mumbai and Bengaluru. The Areo app is an attempt by Google at being the interface between the buyer and the seller, through an Android smartphone. The Areo, its new hyperlocal services that let you get your orders delivered to your current location, another address, or multiple locations. It is currently live in Mumbai and Bengaluru. The Areo app service for various hyper-local brands like Faasos, UrbanClap, Box8, Holachef, Zimmber and Freshmenu. 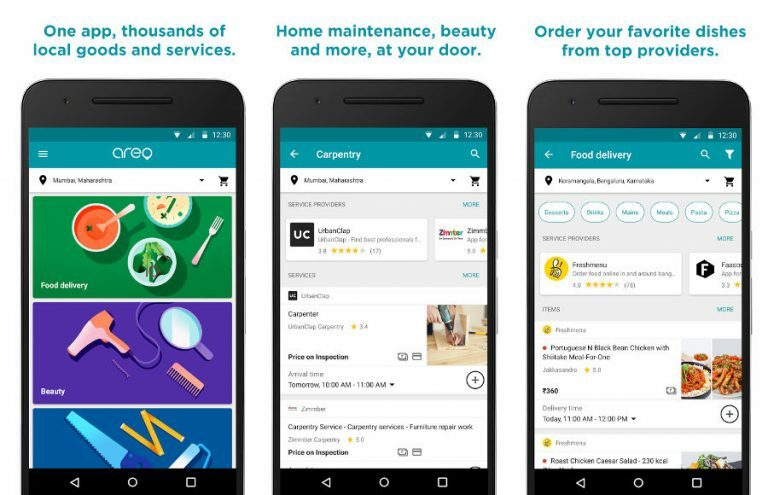 The app is draped in Google’s Material Design and has options related to food ordering services and home services for now. It picks up the location of the user and provides him the supported services available around him. That means if you are hungry, you open Areo and choose various dishes or meals available for delivery to your location. Once you select your choice, you can order the food item through the app and even carry on with the payment process. The app will also notify you about the placed order and various offers as well. You can pay for deliveries and services using your credit card, debit card, net banking, and even directly through Cash on delivery. Google is also offering the Rs.200 discount on food deliveries for a limited period.Download Areo by Google (Free) – Android (Only in Mumbai and Bengaluru currently).